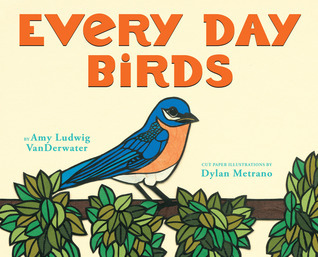 I adore Amy Ludwig VanDerwater and I adore birds so imagine my delight, walking the exhibition hall at ALA midwinter, when I discovered Amy’s new book is about birds! Even more delightful is that she agreed to be my guest to celebrate Every Day Birds (Orchard/Scholastic), which publishes this Tuesday, February 23. Welcome, Amy! I love to read the stories behind books, to learn how authors and illustrators find and follow through on new ideas. Each book has its own family tree, and if a writer thinks about this lineage, s/he can often figure out the grandparents and cousins of a new baby book. Another inspiration for this book is, of course, another and yet another book. 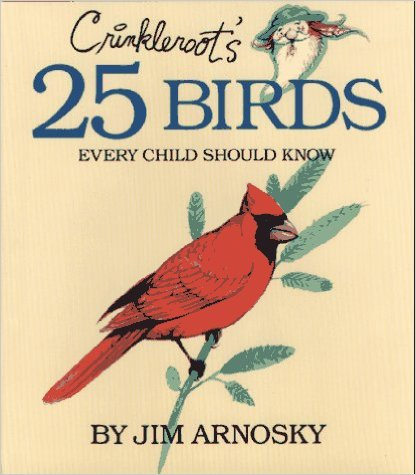 Just a couple of years ago, I purchased a book written and illustrated by Jim Arnosky titled CRINKLEROOT’S 25 BIRDS EVERY CHILD SHOULD KNOW (1993). This book, with only one word per page, lists common birds, and I fell in love with its simplicity and charm. Jim’s book helped me see the possibility of a toddler field guide. 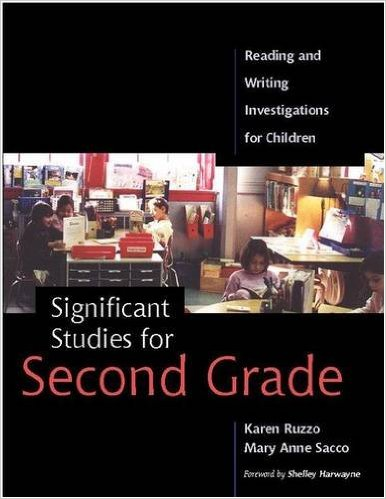 Years ago, I read a professional book by Karen Ruzzo and Mary Anne Sacco titled SIGNIFICANT STUDIES FOR SECOND GRADE. In this book, Mary Anne outlines a research study for young children to learn about local birds. As I once read that children tend to know more about rainforest animals than about their local feathered friends, this fascinated and stuck with me. I wanted to write something that a teacher like Mary Anne could find useful in teaching her second graders. Nicola Davies’ books have interested me for years. 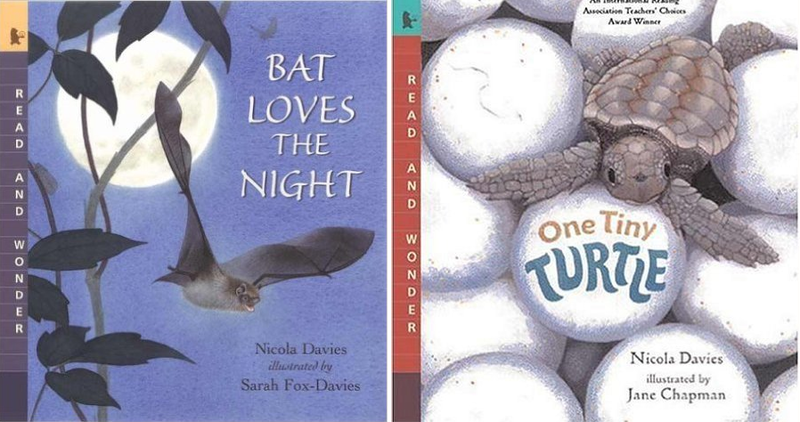 Her BAT LOVES THE NIGHT (illustrated by Sarah Fox-Davies) and ONE TINY TURTLE (illustrated by Jane Chapman), both narrative texts in large print with information in small print, gave me the idea to mix a poem with informational text, similar to the way she mixes stories with information. In fact, the draft I first sent to my agent, Elizabeth Harding, was written as a grid – poem line on the left and non-rhyming information on the right. The first spreads of this book included the poem in big type and the informational text in small type, all on the same page, in the same way that Nicola Davies writes her narrative in big type and her informational text in small type all on the same page. Later, Scholastic editor Ken Geist and book designer Marijka Kostiw decided to move the detailed informational text to the back of the book. 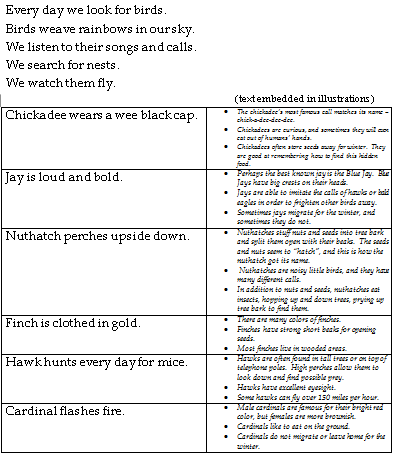 This allows the poem to stand alone, allows a reader to just read the poem and then go to the back for more information. Uncles to EVERY DAY BIRDS include my birder friends Bill Michalek and Doug Happ, two experts I shared this manuscript with, two experts who generously made suggestions and recommendations about what matters most for a book with such limited text. 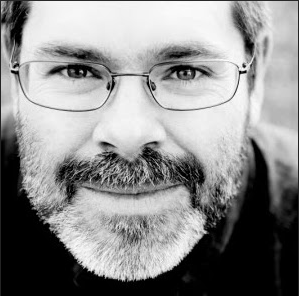 Too, my brother-in-law, Jamey Tielens at the Cornell Lab of Ornithology, has inspired me with his work. Dylan Metrano, papercutter extraordinaire breathes life into these birds. I stand in awe of his art, calling this a book with “a good poem with magnificent artwork.” His process is masterful, and you can watch him at work HERE. Books come together with many many hands and hearts. How lucky am I to have found so many wise ones. 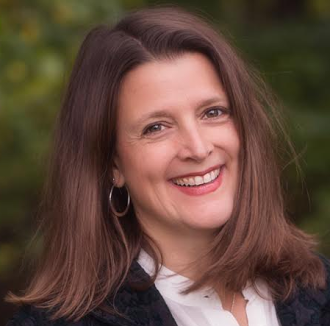 Amy Ludwig VanDerwater is author of FOREST HAS A SONG, EVERY DAY BIRDS, and a few other forthcoming books. Her poems appear in several anthologies for children, and she blogs at The Poem Farm and Sharing Our Notebooks. Thank you, Kirby and Amy! What a wonderful journey through the process of a book (that I know I am going to love). I am such a fan of both of you. Thank you, Amy and Kirby, for sharing the inspiration and beginnings of this special book for young bird enthusiasts. Thank you Kirby for providing us a glimpse of Amy’s new book. I can’t wait to see it. So fun to hear the journey, Amy. Can’t wait to read it! This is so good to hear all the background of one wonderful book, will be lovely to share with students so they will know the story about the book itself. Thanks, Amy and Kirby, I enjoyed it all, will share with colleagues. I am so excited to see this book! It sounds perfect for my wife’s kindergarten classroom. So excited to read Amy’s new book of poems and to learn more about her process in this post. Thanks, Kirby, for bringing her to Friend Friday. I love the idea of each book having it’s own family tree. Thanks for sharing this interesting post. So looking forward to this book! And now it will be fun to have this interview to tuck inside the front of it! Thanks to Linda Andersen for sharing your blogpost, Kirby. It was fascinating to learn the backstory of Amy’s book! Thank you! Amy, thank you for sharing your journey with EVERYDAY BIRDS. I loved reading about the story behind the story. Cardinals hold a special place in my heart. My mom passed away last year and a cardinal appeared at that very moment outside her window. Now, it seems whenever I am missing her the most, a cardinal will fly into my yard or onto my patio. Such fun to learn about the back story! Am picturing Amy’s book wrapped up with a wee set of binoculars for a birthday gidt for my great niece. Thanks all!